What a lovely evening last Thursday was. Post work vino at my new favourite bar with a good friend - the bar; Golden Dawn, Ponsonby Road, Auckland if you live in this neck of the woods. And very un-Ponsonby it was too...that may well be part of it's appeal! It is understated, so understated I almost couldn't find the door! When I did find my way in it is dark and a little rustic. I was won over almost immediately by the knowledgeable bar man who whisked away the wine list and asked how I like my wine...red or white...crisp, buttery, fruity, toasty. Oddly enough in the mood for white and I do like buttery so I was prescribed a requisitely buttery, though subtly and sophisticatedly so, French chardonnay. That was just the aperitif to an Autumn vegetarian cooking class across the road at Cook The Books. If you like cook books this could be a dangerous shop. Out the back is a kitchen and dining room, and on Thursday 8 of us were there for some vegetarian inspiration. Highly appropriate after last weekend's sausage adventures and huge simmering pot of beef bourguignon. If you want to see what we cooked up you can check out the photos here. 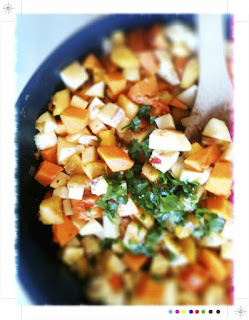 This was inspired by a squash crumble from Martha Stewart. 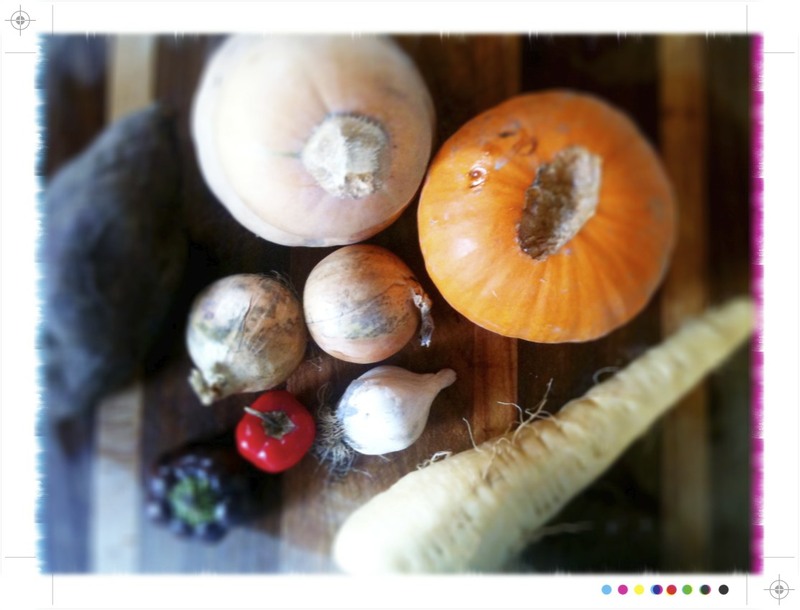 You can use whatever winter vegetables you have on hand that will roast well. Here I used a mixture of pumpkin, parsnip, celeriac, carrot, golden kumura and Maori potatoes, which are a quite spectacular purple colour. 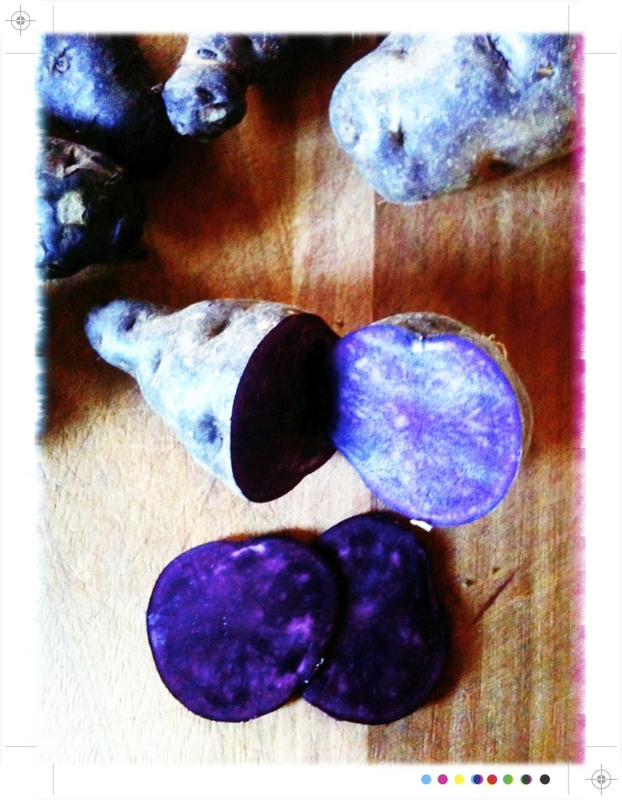 If you can get your hands on Maori potatoes roast them separately to avoid everything turning a purple hue. 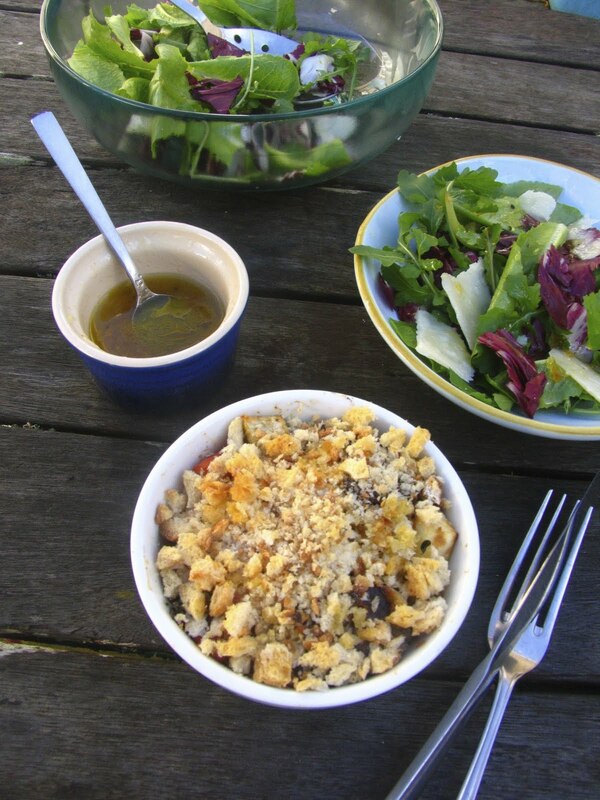 You can just roast the vegetables and top with the crumble mixture or even some rustic breadcrumbs mixed with some chopped time and knobs of butter for the last bit of cooking time. 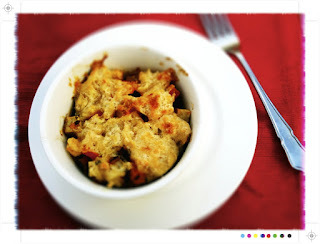 The bread crumbs provide a little more crunch than the recipe below...I like both. 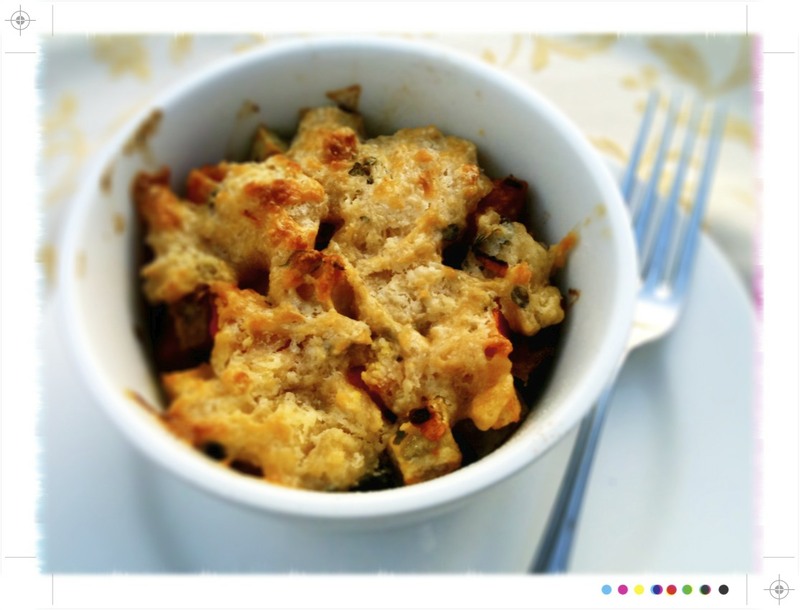 The bread crumbs are a little lighter but and the crumble mixture a little more comforting. Sauteing the vegetables first with the onion, garlic and chilli adds a level of sweetness that simple roasting didn't deliver. Essential is that little bit of chicken stock, keeping the vegetables moist and avoids them drying out. 100g Kikorangi or other blue cheese, you could also use feta, crumbled. This is optional but really does make a difference. Butter the individual or one large baking dish and set aside. Heat the olive oil in a large frying pan over a medium heat. Add the shallots, garlic, chillis and season with salt and pepper. Saute for a few minutes until soft and translucent. Add the vegetables and saute for a few minutes more. Do this in batches if need be. Place all the vegetables in a large bowl and add the parsley and stock. 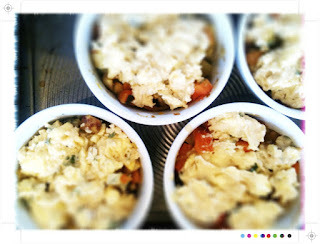 Mix everything together and then place in to the prepared dish or individual dishes. Cover with foil and place in the oven for 30 minutes. Meanwhile prepare the crumble. Place the flour, sugar, thyme in a bowl and season with salt and pepper. Add the butter and rub until you have a coarse looking mixture, there will still be the odd lump of butter. In a small bowl whisk together the egg and water. Add this to the flour mixture and mix until just combined, no need to over work it. If it is too dry just another tablespoon of ice water. Set the crumble mixture in the fridge until the vegetables are roasted. 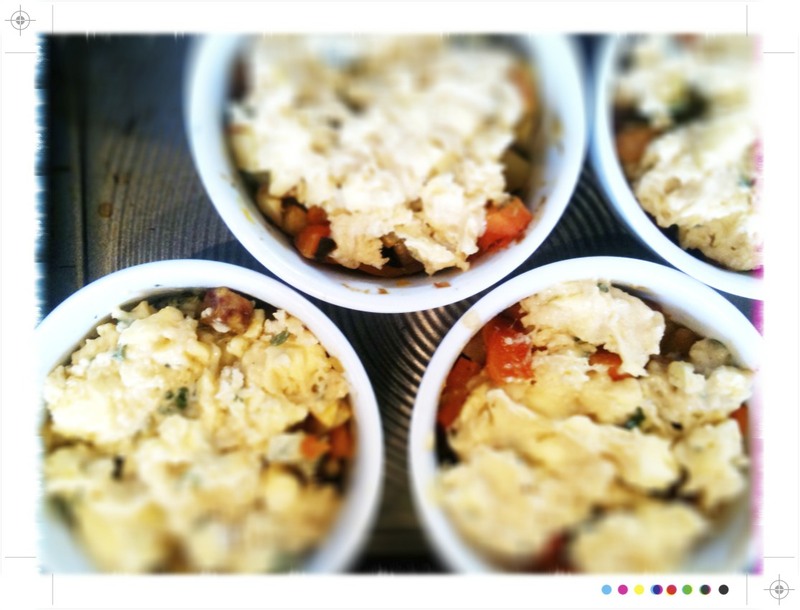 Remove the vegetables from the oven ans gently stir through the cheese. Scatter over the crumble topping ans pop back in to the oven for another 30 minutes or until the topping is golden brown. Serve immediately. It is great as a side or as a meal on its own and it also reheats well, so quite a versatile little dish. The vegetables are sweet with a little heat from the chilli and both pair nicely with the tangy Kikorangi, which cuts through the sweetness. Then the comfort of the almost scone like topping is perfect for fending off all my winter carb urges. Lunch today was the bread crumb topping version with a little winter salad drizzled with my new favourite dressing...that to come soon. 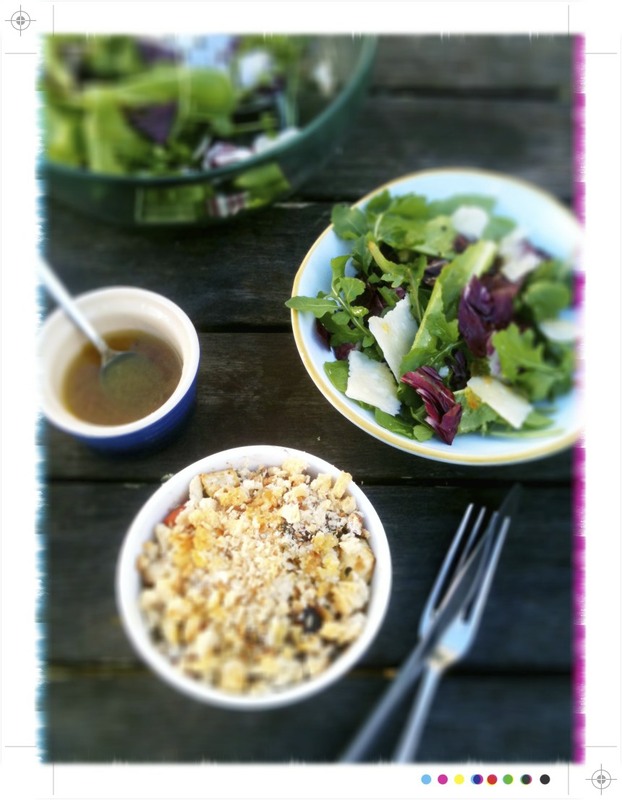 It think it may well be the holy grail of livening up winter salads. In the meantime, the sun was shining today, so lots of lovely natural light and time for a little more iPhone v camera. And I have to say today I am torn, I may even like the 'camera' better - now that is a first. Mm, I never think to make savoury crumble but I can't see why not! Sounds lovely with the Kikorangi. Mmmmh, perfect for me :-).